Babolat Pure Aero 3 Pack 2019. The Babolat Pure Aero 3 Racquet Bag comes from the 2019 Pure Aero bag collection from Babolat. This bag is ideal for players who are looking for a handy tennis bag that can accommodate up to 3 tennis racquets. The bag is made of durable materials and has one large main compartment. The smaller zippered compartments can be used to safely store keys, wallet or on court accesories. The lightweight material is waterproof and offers protection against all weather conditions. The bag is equipped with a handle, but can also be easily carried on the shoulder thanks to the adjustable shoulder strap. Tennis Direct is an Australian family owned and operated business. We are passionate about tennis and are determined to offer competitive prices across our entire range, regardless of where you live across Australia. And we'll be delighted to assist you. If your racquet is discontinued we will provide you with a suitable replacement model. This is often the case in brand-name electrical items, mobile phones, computers and IT products. Products damaged in transit must be reported to us within 24 hours of receipt of the product. If you receive a product that you think is defective, you are to immediately contact our Customer Service Team who may provisionally determine whether the product is defective. How to request a return for defective or DOA items. As soon as the problem arises stating your order number, the item(s) you are returning and details of the problem. Our Customer Sales Team will then issue a Return Authorisation Number (RA#) and provide you with a return address. Please feature the RA# prominently on the outer packaging when you send it back to us. Please do not write the number on the item packaging itself. The RA# is valid for 14 days so please return the item immediately. If you have any questions. All orders will be delivered using Australia Post eParcel service. Your order will be delivered to your address and require a signature upon receipt. Please be sure to add all Unit/Flat and Business names as appropriate for your order. We work hard to ensure that your order is delivered as soon as possible with over 93 percent of orders picked, packed and dispatched within 24 hours of the order being placed. It is important to note that orders can only be dispatched Monday to Friday. We will respond as quickly as we can during trading hours. Australias tennis equipment experts, online for you 24/7. Register to receive special offers and discounts. 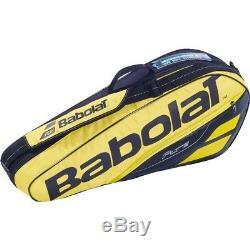 The item "Babolat Pure Aero 3 Pack 2019 Tennis Racquet Bag" is in sale since Tuesday, October 30, 2018. This item is in the category "Sporting Goods\Tennis\Bags". The seller is "tennisdirectaust" and is located in Alstonville. This item can be shipped to Australia, North, South, or Latin America, all countries in Europe, Japan, Hong Kong, New Zealand.